Support The GP and you could win a free car! This year, we are excited to partner again with the Davis Love Foundation and the RSM Classic for the Friends of Davis Love Foundation Raffle. This program is administered by the Davis Love Foundation and designed to help raise money for charities. 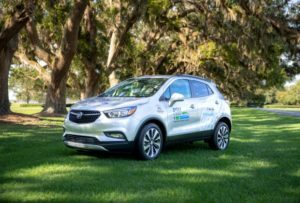 Each participating charity sells raffle tickets ($20 each) for the chance to win a brand new Buick Encore from Nalley Brunswick Automobiles! The cool part? 100% of the money collected through the raffle is distributed back to the participating charities. Also, there is a bonus pool of $75,000 put forward by the Davis Love Foundation for the charities that sell the raise the most amount of money. The more tickets The GP sells, we will receive a higher percentage of the bonus pool! You have until Friday, November 9, 2018 to get your raffle ticket and help us raise money for The GP. A drawing for the Grand Prize winner of the Buick Encore will take place during The RSM Classic. To get your ticket, simply email: Victoria@TheGP.org or call our office: 912-264-3474. You can also come by our office or Victoria will be glad to hand deliver the tickets to you!